The v1.4.0 of WPNewsman is finally released and available for download. In this version we changed the email template editor. 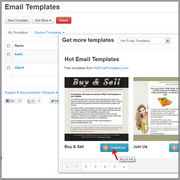 Now you can customize your email templates including system templates in any way you want. One of the main additions is a rich template store where you can download and install email templates from. Plus, we added the capability to import the email template from a file (.zip) and export the template to a file.